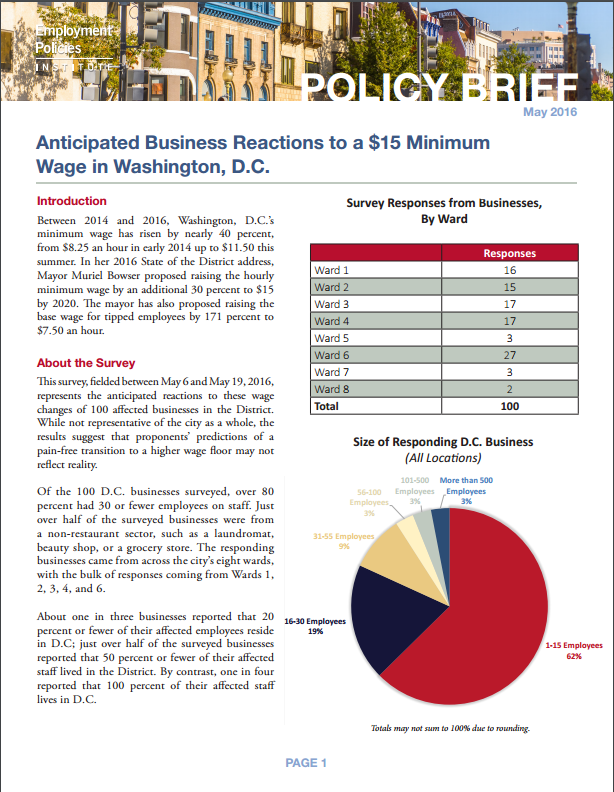 Anticipated Business Reactions to a $15 Minimum Wage in Washington, D.C.
Over 80 percent of the surveyed businesses had 30 or fewer employees; the heaviest concentration of respondents came from Wards 1, 2, 3, 4, and 6. Over half of surveyed businesses reported that 50 percent or less of their affected staff members reside in D.C.; one in three businesses reported that fewer than 20 percent of their affected staff reside in D.C. Two-thirds of surveyed businesses agreed (and 50 percent strongly agreed) that the District is becoming less-friendly for businesses.